Young children are engineers in the sense that they modify the world to satisfy their own needs and wants. This paper describes how teachers in a constructivist early childhood program created an environment where young children would naturally gravitate toward designing and building intricate block structures to nurture their developing abilities in engineering and design. The teachers introduced a project called Ramps and Pathways to push children to further develop their emerging abilities. 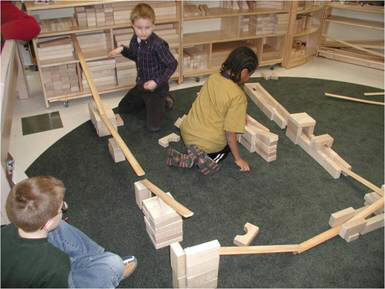 In addition to exploring how teachers can emphasize engineering design and incorporate developmentally appropriate math, science, and technology skills in an early childhood program, the paper discusses the opportunities that engineering design affords for children’s socioemotional development and concludes with a discussion of how the Ramps and Pathways project helped promote engineering habits of mind in the children. These are exciting times for early childhood education. Its relevance and importance are being acknowledged by an increasing number and variety of organizations. At the federal level, the 2008 Obama/Biden party platform outlined an emphasis on high-quality early childhood education in addition to high-quality K-12 education (Democratic National Convention Committee, 2008). Currently, an unprecedented level of cooperation is occurring between the Departments of Education and Health and Human Services with regard to early childhood education. The No Child Left Behind (NCLB) act signed into law by President George W. Bush focused on early literacy through the development and implementation of the Early Reading First and Reading First initiatives (NCLB, 2002). From the business community, Nobel-prize-winning economist James Heckman (2006) called for more funding for early education, specifically in PreK grades, stating that at-risk children are more apt to fall into crime and fail to contribute to American productivity, putting the nation’s economic system at risk (Heckman & Masterov, 2007). From the law-enforcement community, the organization Fight Crime: Invest in Kids (2001) advocated for early education as a crime-fighting measure. Even the military, represented by a group of senior retired military leaders through the organization Mission: Readiness, released a report that called for a greater investment in high-quality early learning in PreK. In the report, members argued that it is in early childhood education that children begin to develop a sense of right and wrong and acquire the ability to remain with a task until completion (Mission: Readiness, 2009). At the same time, the economic crisis and concerns about climate change have led to increasing attention on the domains of science, technology, engineering, and mathematics (STEM) in educational curricula. Many believe the ability to sustain our quality of life and address the grand challenges of our times hinges upon the successful engagement of our younger children in STEM subjects. Across the nation, discussions about how STEM education can be improved and how more students can be recruited into the STEM pipeline are taking place. However, engineering seems to be missing in much of this discussion (Katehi, Pearson, & Feder, 2009). This point was driven home in a White-House-sponsored STEM workshop by a question posed to Charles Vest, president emeritus and professor of mechanical engineering at the Massachusetts Institute of Technology. Toward the end of the workshop, Steve Robinson, special advisor to the U.S. Secretary of Education, turned to Vest and asked, “Where is the E in STEM? Doesn’t engineering have a role?” (Vest, 2009). Incorporate important and developmentally appropriate mathematics, science, and technology knowledge and skills. What is engineering’s role in early childhood education? In this paper, we take the position that early childhood programs already possess the potential for rich engineering and technology education, but this potential has gone largely unrecognized by both early childhood educators and STEM advocates. By examining what young children spontaneously and with great enthusiasm design and create, we reveal the potential for integrated STEM education that is rigorous and relevant for early childhood students, respectful of the ideas and capabilities of young children, and rich with the possibility of enhancing the education of the whole child. The design process is defined as the engineer’s approach to identifying and solving a problem. This approach is iterative; open to the possibility of multiple solutions; a context for rich mathematical, scientific, and technological conceptual development; and an inspiration for systems thinking, modeling, and analysis (Katehi et al., 2009, p. 151). We argue in this paper that this process is already present in high-quality early childhood programs, particularly those that identify themselves as constructivist in nature. In this section, we discuss briefly the relationship between constructivist pedagogy and the design process, and we describe one traditional early childhood activity that exemplifies this process. Constructivist pedagogy is, at its core, all about problem solving and is a natural fit with engineering education. Teachers operating within constructivist pedagogy work to identify children’s interests; structure lessons around big, foundational ideas; and pose problems to students that are relevant and interesting to them to develop conceptual understanding of those foundational ideas. Constructivist teachers value students’ points of view and yet challenge their suppositions (Brooks & Brooks, 1999). Within constructivist pedagogy, the teacher considers the knowledge and content of the subject domains and structures the classroom to provide provocative experiences so that students will encounter meaningful problems that put them in a state of disequilibrium. The teacher intervenes and supports the children in their inquiry and efforts to restore equilibrium through questioning and/or the addition or reduction of classroom materials (Piaget & Duckworth, 1973). What kinds of problems motivate children to engage in engineering design, and what does engineering design look like in early childhood? Among the many traditional learning centers in early childhood classrooms that are rich with opportunities for engineering design, one stands out—the block center. In exploring ways to integrate meaningful physical science curriculum in their PreK through second-grade classrooms, constructivist teachers at the Freeburg Early Childhood Program at the University of Northern Iowa selected unit blocks as a basic and ongoing center. 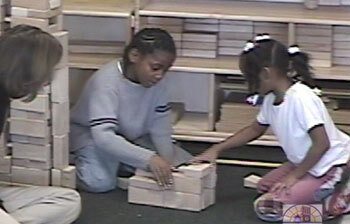 By providing high-quality materials such as unit blocks, teachers created the environment where children would naturally gravitate toward designing and building intricate block structures. While some observers view child-initiated design and creation as frivolous play, we view this play as children’s work. Children grappled with thoughts concerning stability, balance, properties of materials, as well as number and spatial reasoning—all content within the domains of science and mathematics (Chalufour, Hoisington, Moriarty, Winokur, & Worth, 2004; Reifel, 1984). Brophy and Evangelou (2007) assert that children’s work of building structures can be identified as precursors to engineering thinking. Observing young children’s block play, Brophy and Evangelou conclude that the children’s actions revealed that they were constructing beyond a visual representation to an actual structure. Their observations also revealed that young children employed details of physical properties to allow them to create increasingly complex designs that worked within the governing properties of physics. Therefore, the unit block center is an excellent place for early childhood teachers to begin exploring engineering design with young children. As Freeburg teachers noticed children’s interests beginning to wane in building block structures, the teachers added a ramps-and-pathways component to the block center. Teachers found that by adding materials such as one-, two-, three-, and four-foot lengths of cove molding to the unit blocks center, children were inspired to use these materials to build ramp structures that would enable a variety of objects to move. This allowed them to independently explore force and motion, concepts within the domain of physical science that are nearly absent from early childhood curricula (see Figure 1). Figure 1. 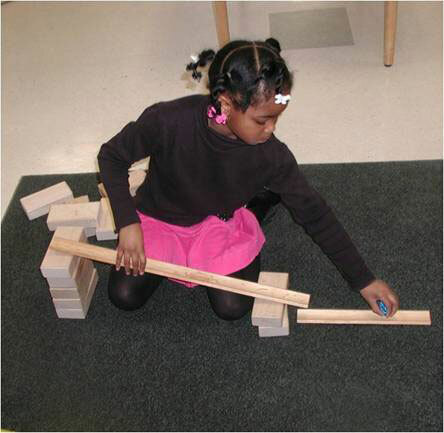 The addition of cove molding to the unit blocks center inspired children to build ramp structures, which allowed them to explore force and motion. The teachers soon observed that students were developing a basic practical understanding of the properties of objects and the relationships among such things as steepness and speed, weight of objects, and distance rolled. They also noticed something about the children’s attitudes; that is, they never asked for the center to be taken down. There was always something different to try, another design to attempt. Over time, children’s ramp structures became more sophisticated and intricate; their explanations of their ideas and reasons for success more detailed and focused; their self-imposed challenges more difficult. Observations of children’s interest and progress in scientific reasoning prompted us to launch the NSF-funded Ramps and Pathways project to study children’s engagement with and exploration of the movement of objects on inclines—a rich opportunity to support children’s developing practical understanding of force and motion that would lay a foundation for children’s later development of conceptual understanding. The topic seemed to offer a perfect combination of rich intellectual work and focused play-based investigation. We believe the reason why the Ramps and Pathways center was so successful was because we had unknowingly tapped into the E in STEM. Our students more closely resembled budding engineers than budding physicists. Instead of figuring out how to add engineering design to our curriculum, our students had revealed to us where engineering makes sense to them in curricula and materials already in place in many early childhood settings. While there are several current attempts to add engineering design to early childhood classrooms (many of which include projects lasting a week or two), we believe it is fruitful to examine the possibilities that exist in centers already in place. We argue that by taking an engineering perspective and selectively adding materials, teachers can address the three principles of engineering education recommended by the Committee on K-12 Education in an enriching and meaningful manner that engages children far longer than a few weeks. In this section, we examine the three recommended principles (cited above) and allow the children’s work to reveal how these principles are addressed in developmentally appropriate and meaningful ways for young children. The Committee on K-12 Education argues that an emphasis on the iterative, open-ended, problem-solving method known as engineering design is the central activity of engineers (Katehi et al., 2009, p. 151) and should be the first principle of engineering education. The committee warned of difficulties in teaching engineering design as practiced by engineers, stating that it is not quickly learned by students and is not easily taught by classroom teachers. As evidence, they cite pedagogical research that documents inefficient trial-and-error methods instead of using a systematic approach and warns against spending too much time defining a problem. The committee recommended that teachers explicitly encourage a systematic approach (Hill & Smith, 1998; Ressler & Ressler, 2004; Seiler, Tobin, & Sokolic, 2001). However, the studies guiding the committee’s recommendation involved students at the middle and high school level, not early childhood, leading us to wonder how explicitly engineering design should be taught or introduced to young children. Current engineering curriculum designed for elementary students follows the committee’s recommendation by placing a strong emphasis on such a design process. Engineering is Elementary (EiE), a program developed by the Boston Museum of Science, advocates for a five-step engineering design process for children consisting of Ask, Imagine, Plan, Create, and Improve. The curriculum provides examples of questions to guide students through each step, depicted below (Cunningham & Hester, 2007), through a series of lessons spread over approximately seven days. Make lists of materials you will need. Follow your plan and create it. Talk about what works, what doesn’t, and what could work better. Modify your design to make it better. Under this advisement, we analyzed our young children’s engineering-related experiences to see how they engaged in the design process. Engineering is defined as “design under constraint” (Wulf, 1998). The basic constraints with which our students were working involved the laws of physics, the materials, and the physical space. Instead of posing explicit and complex design problems for the students to solve, our teachers added lengths of cove molding and a bucket of objects with various properties to the block center and provided broad queries such as, “I wonder what you can figure out to do to get these objects to move?” With the initial question of getting an object of their choice to move, children immediately personalized the question or problem through their choice of materials. Some children chose plastic eggs, while others chose small cars, blocks, or jingle bells. 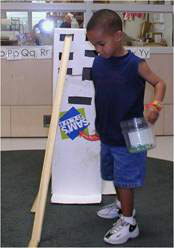 These children’s implied questions appeared to be related to whether and/or how the objects would move on an incline. Other children, appearing to understand that spheres easily roll down inclines, selected marbles to explore questions such as how far or how fast they could get their objects to move. The children were motivated, thoroughly engaged, and genuinely interested in finding out if their own ideas about design as well as force and motion would work. Our observations led us to conclude that in the early years, it is important that children be allowed to investigate their own questions. We found that for young children, the engineering design process does not reveal itself as steps but rather as nonsequential components that may often be enacted by children simultaneously (sometimes within a few seconds) and would often quickly result in new questions. Much like engineers in the field, the children used, repeated, or skipped components of brainstorming, planning, testing, and improving as the project or question dictated. The young children’s use of the components also differed in the manner in which they brainstormed, planned, created, and improved. For example, with regard to the ASK component from the EiE engineering design process, children didn’t always stick to one question and see it through. Often, they became intrigued by a peer’s work and would abandon their original question to work alongside or with their peer to solve their peer’s design challenge. We found children merging the components of IMAGINE, PLAN, CREATE, and IMPROVE and enacting the component of PLAN informally. In the component of planning, we found that children verbalized their plans or held a mental image but almost never drew out their plan on paper before, during, or after they began to build. We believe this component is done mentally by children for several reasons. First, children already have something of a mental picture of what they want to see happen and are eager to replicate their idea with the materials. For young children, requiring them to first draw it seems an unnecessary interruption and misuse of valuable time in their design process. Second, while young children can think 3-dimensionally, they have difficulty representing a 3-dimensional mental image on a 2-dimensional plane. The requirement of recording a plan on paper would demand a great deal of mental energy that is better spent on building their mental design. Third, young children’s design plans are dynamic and evolve as they build or work with the component of creating. The component of IMPROVING would be difficult to tease apart from the other components because the children improve their designs constantly as their growing understanding of the constraints of physics dictate what is and isn’t possible in their design. Although this trial-and-error behavior (what we like to call “error-informed experimentation”) tends to be frowned upon in upper grades, we believe it is necessary behavior for young children in developing understanding of physics. The desire to design and build enables children to develop spatial reasoning and a working understanding of physical science. Provided with a reason to count, to seriate, to measure and compare, to consider space and time, the child demonstrates that STEM education works best when all aspects of the acronym are considered (Katehi et al., 2009, p. 162). This satisfies the second principle advocated by the committee regarding the incorporation of important and developmentally appropriate mathematics, science, and technology knowledge and skills. To illustrate a young child’s use of the design process in Ramps and Pathways, we provide a vignette we often see at the beginning stages of work in the ramps and pathways center. This vignette provides opportunities to identify what the child brings to the design process based upon prior experiences, and the components of the design process. In the beginning of building, a young girl is excited to create a ramp to make her marble go fast. She wants her marble to go fast because in her world fast is best. Fast wins races. She also seeks a marble that is big in size and weight because in her world big overpowers small and power is held in high regard. The girl places a section of cove molding or track against a chair and releases the marble at the top. She squeals in delight as she watches the marble roll quickly down the ramp and across the floor. After several tries, she decides to change the position of the ramp, and she sets it on a bookshelf at a lower height and finds that the marble does not roll as quickly or as far. After several tries at changing the steepness, she decides that the steeper the track, the faster her marble will roll. She overgeneralizes and stands the track nearly perpendicular to the ground and releases the marble with the expectation that it will go the farthest and the fastest (see Figure 2). She is surprised when the sphere falls, bounces several times, and comes to a stop. She tries this design several more times until she is satisfied that the design is unworkable and returns to work, placing her ramp against the chair. Dissatisfied with her ability to vary the steepness of the track when placing it against a chair, she selects a number of unit blocks and stacks them up to reach the desired height and leans the track against the stack. In this way, she begins to add or take away blocks until she is satisfied with the speed of her marble. Once satisfied, her attention turns to increasing the complexity of her design by adding other sections of track. Figure 2. A young boy creates a ramp to make his marble go fast. Analyzing the scenario above, we see that she is moving between the components of the engineering design process quickly and often. She IMAGINES the marble moving fast, PLANS to make the marble move fast by positioning the track against the chair, and CREATES the incline in what could be less than 15 seconds. We could argue that she does not even ask a question at first. She may be in a state of equilibration in which she believes that her plan will work and simply desires to build it. It may only be after she begins having difficulties or finds herself in a state of disequilibrium that her design process becomes more systematic. When she has a problem in her original design, she may ASK herself what the problem is and perhaps consider what she has seen others do. She may IMAGINE some solutions and immediately CREATE the change and test it. Through observation, she determines how successful the change was and then performs some iterative changes to IMPROVE her design until she is satisfied with the results. 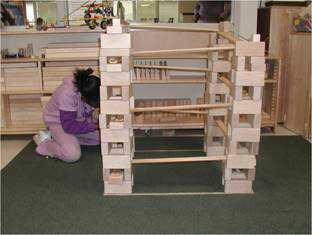 We also include here a video of two second-graders who have built an impressive ramp structure using only unit blocks. 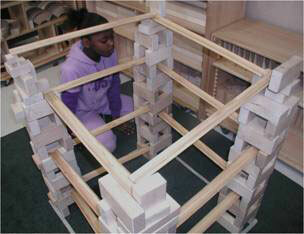 In the first segment, the children can be seen working on the structure independently. It appears that they IMAGINE what they want to build and then CREATE it. In the second segment, the teacher (the first author) enters the scene and questions the children about their structure. She asks them to show her how it is constructed, drawing their attention to not only what they have done but how they did it. In order to answer her question, the children must reflect on their system. In the third and fourth segments, she goes deeper, questioning the children about the problems they encountered and how they addressed these problems to IMPROVE their structure, and about the purpose of certain aspects of their design. Finally, the last segment shows the finished structure and how it works. Video 1. Second-graders build a ramp structure. Video 2. Second-graders build a ramp structure. Video 3. Second-graders build a ramp structure. Video 4. Second-graders build a ramp structure. In this environment, young children have the luxury of time to immerse themselves in the engineering design process on a daily basis. They have the possibility to engage deeply in meaningful questions that they pose to themselves. One of the beauties of this physical science/engineering center is that students do not compete with designs of others but are content to concentrate on improvements relative to their starting points, an asset identified in a middle-school study (Sadler, Coyle, & Schwartz, 2000), but one we believe to be essential in early childhood as well. The children are not dependent upon an adult to guide them through every selection of a design component. Their tests (held against nature) are carried out without the constant oversight of the teacher. This allows the children independence in their creative designs. Within this open-ended center, children can engage in the design process many times on a daily basis, giving themselves opportunities to develop engineering habits of mind, which we address in the following section. The third recommendation of the Committee on K-12 Engineering Education calls for the promotion of engineering habits of mind. The committee suggests that these “habits of mind” are akin to essential skills for citizens in the 21st century. These skills include systems thinking, creativity, optimism, collaboration, communication, and attention to ethical considerations (Katehi et al., 2009, p. 152). We found that children’s work in Ramps and Pathways authentically addresses all these skills in ways that are meaningful and long-lasting for young children in the following ways. Systems Thinking. Systems thinking involves “the ability to recognize interconnections in the technological world” (Katehi et al., 2009, p. 152). In the children’s technical creation of ramp structures, they gradually come to understand their structure as a series of subsystems and that making an adjustment in one subsystem will affect others. Evidence that children do not yet see their structure as a system can be seen, for example, when 3-year-olds shift one end of a segment of cove molding to the left or right so that it will align with the next segment. But shifting one end of the segment causes the other end to shift in the opposite direction. Preschoolers are frequently surprised and perplexed by this, and only after experiencing it several times, do they begin to recognize when it will happen. Evidence of systems thinking can be seen, for example, in children’s efforts to get a marble to turn a corner (something that most children attempt at some point in the design process). One solution to the corner problem is to elevate the starting end of the first ramp and then place a block at the end to allow the marble to ricochet onto the next ramp. If the force of the marble onto the ricochet block is too great, the marble’s trajectory will be off the second ramp. Success requires the coordination of the first ramp’s degree of incline with the position of the block and second ramp. That is, the child can lower the incline, thus slowing the marble down so that it does not strike the ricochet block with as much force, and bounces gently onto the second ramp (see Photo 3). Figure 3. Children try to get a marble to turn a corner. The coordination of the ramp subsystems becomes finely tuned with our young engineers. We witnessed a second-grader coordinate a total of thirteen 3-foot ramps at right angles to each other to create a ramp system spiraling down to allow a marble to travel 39 feet on a structure that took up only 9 square feet of floor space. This structure was beautiful in form as well as function. The child was so engaged in this process that she invested over two days working on her design before deciding that her limitations in physical height would not allow her to continue (see Figures 4 and 5). We also witnessed builders creating complex systems consisting of a series of fixed ramps in combination with two tracks balancing on fulcrums that tipped in a manner precise enough to successfully place the moving marble onto the next piece of the ramp system (see Figure 6). Figures 4 & 5. A second-grader creates a ramp system spiraling down to allow a marble to travel 39 feet on a structure that took up only 9 square feet of floor space. Figure 6. 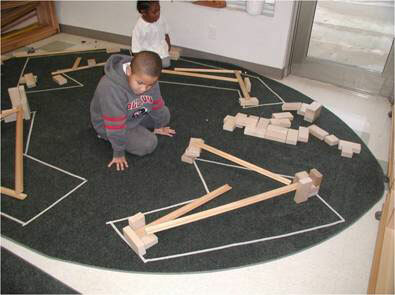 Children create a complex system of fixed ramps in combination with two tracks balancing on fulcrums that tipped in a manner precise enough to successfully place the moving marble onto the next piece of the ramp system. Creativity. As can be seen in the descriptions in the previous paragraph, the design process in and of itself exemplifies creativity. We celebrate any opportunity for children to demonstrate creativity through engineering design while they may still be searching for their creative edge in literacy. To our dismay, NCLB has placed such an emphasis on reading and mathematics in the primary grades that STEM has been left far behind. Student test scores influence decisions about instructional time, curricular emphasis, professional development, and ultimately what is valued in the classroom. Within the past year, we have heard from primary grade teachers who have been instructed not to teach science or social studies and to focus only on reading and math after their schools were identified as “Schools in Need of Assistance.” We mourn the absence of opportunities for engineering creativity in these classrooms and the resulting contraction of children’s educational and professional productivity. Optimism. Optimism is defined as “a world view in which possibilities and opportunities can be found in every challenge and an understanding that technology can be improved” (Katehi et al., 2009, p. 152). The facilitation of Ramps and Pathways fosters resilience in young children. We found that when children engineered their ramp structures, they developed persistence and self-confidence in their abilities. Students’ beliefs about themselves influence their entire approach to learning and ultimate success. Students with self-efficacy persist when faced with difficulties and display resilience when facing learning challenges (Bandura, 2001). Perhaps the opportunities that engineering design affords for children’s development of resilience and self-efficacy may spur administrators to rethink their decision to eliminate or drastically reduce STEM from early childhood. Literacy researchers are beginning to draw attention to the importance of socioemotional development for literacy development. Pajares (1996) found that literacy skill development and socioemotional development demand equal attention. Literacy skills are important, but they cannot develop without effort and persistence. A student’s attitude toward mistakes and failures has a great deal of influence over academic growth (Pajares, 1996). In an article directed toward reading educators, Johnston (2005) argues that literacy screenings should include assessments of academic resilience. Learners who are resilient are not focused so much on what abilities they have but rather use challenges to build ability. Their attention is more on the learning process and less on the performance (Johnston, 2005). Niemi and Poskiparta (2002) found that assessments of resilience in kindergarten are more predictive of success in reading than assessments of phonological awareness. Students who scored high in resilience did better on word recognition than students who scored high in phonological awareness (Niemi & Poskiparta, 2002). Research on self-efficacy and student achievement has led to research exploring environments that foster self-efficacy and resilience. Least effective are classrooms that primarily use direct instruction models, where teachers teach to the whole class, control discussion, and control decision making. Yet lectures, drill and practice, and an overreliance on seatwork is what Haberman (1991) found most often in schools serving a minority underserved population—just the population the engineering profession hopes to reach. Collaboration. Collaboration in the engineering educational environment is heralded in how it “leverages the perspectives, knowledge, and capabilities of team members to address a design challenge” (Katehi et al., 2009, p. 152). We certainly saw this in our young students as they enlisted the help of others in getting their designs to work, offered advice and encouragement to others, and even worked to figure out how to merge two working systems into a larger system (see Figure 7). In fact, we routinely observed cooperation and collaboration among children who exhibited extremely difficult and challenging behaviors and who otherwise appeared incapable of cooperation. Somehow, the design process engaged them to such a degree that their behavior problems abated. Figure 7. Young students helped each other to get their designs to work and figured out how to merge two working systems into a larger system. Communication. We observed that Ramps and Pathways provided a rich context for using language for a variety of purposes. As children attempted to assist others in designing their ramp structures, negotiated goals for their ramp structures, and explained how they were able to get their designs into working order, we saw them take turns in speaking, listen closely to one another, and search for appropriate vocabulary to articulate what they desired to convey. For English-language learners, Ramps and Pathways served as an excellent medium to map actions to words in an environment that was nonthreatening. Many times, Freeburg teachers and students would come together as a group and discuss what they were learning in their designs and questions or problems they were encountering. These discussions provided authentic reasons to record their thinking—an opportunity for the teacher to model writing or engage children in interactive writing. Teachers used digital cameras to capture images of the whole system as well as specific points of design interest within the system. Children would use these photos along with their written explanations to create documentation boards to communicate their learning to school visitors. Attention to Ethical Considerations. Finally, in regard to ethical considerations, instead of general conversations about ethics in the outside world, ethics became personal and real for children working in the Ramps and Pathways center. For young children designing ramp structures, ethics demanded respecting each other’s safety, ideas, materials, and space. In matters of safety, classroom discussions were held on how to carry long, linear tracks safely around the room without striking another structure or classmate. Children brainstormed ideas about how to keep track of marbles to prevent peers and visitors from slipping on strays. In matters of ideas, we found that children were not protective of ideas when they found that we learn more when we collaborate and share. We tended to hear cries not of, “He copied me!” but rather, “Hey! You just gave me an idea!” They found that alone they could be good, but together they could be great! Finally, in matters of materials and space, we observed young children negotiating space and materials in the process of design and construction. When children began running out of unit blocks to create their structures, the constraint of limited resources became real, and they began to be more purposeful in how they used the resources so that more children could build. 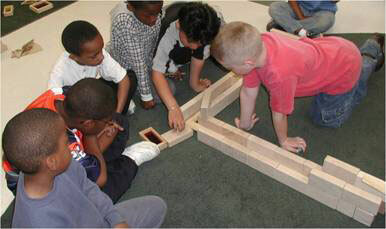 When many children were involved in creating long, linear ramps, classroom space became an issue. A discussion about how this design affected other areas of the classroom ensued, and they resolved to learn to build in more-confined spaces (see Figure 8). We likened this situation to real estate in cities and talked about how to get as much traveling distance as possible in a small square footage area. We added another design constraint of confined area, taping off sections for building on the carpet, and challenged children to design marble runs that built up rather than out. Figure 8. We added another design constraint of confined area, taping off sections for building on the carpet, and challenged children to design marble runs that built up rather than out. Children have long been recognized as young scientists in the way they explore and try to make sense of their environments. In this paper, we make the claim that young children are also young engineers in the sense that they modify the world to satisfy their own needs and wants. 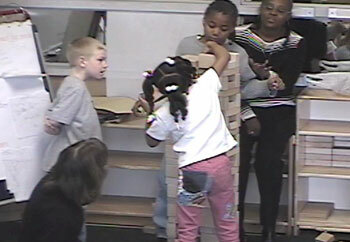 Early educators can take advantage of activities that already occur in most early childhood classrooms (such as building with unit blocks) to nurture young children’s developing abilities in engineering and design, as well as provide new activities (such as Ramps and Pathways) that push children to further develop their emerging abilities. Young children can create, solve problems, experiment, test, adapt, collaborate, explain—in short, they can participate in the design process as young engineers (see Figure 10). Figure 10. 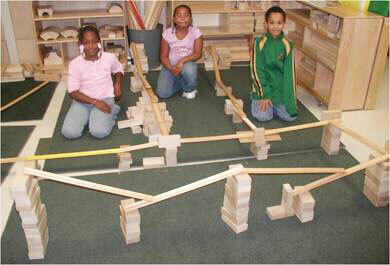 Children participate in the design process as young engineers. This material is based upon work supported by the National Science Foundation under Grant No. 0628082. Any opinions, findings, and conclusions or recommendations expressed in this material are those of the author(s) and do not necessarily reflect the views of the National Science Foundation. Arquin, Michael; Lachapell, Cathy P.; DeCristofano, Carolyn; Cunningham, Christine M.; Hester, Kate; Higgins, Melissa; et al. (2008). Catching the wind: Designing windmills: Air, weather, and mechanical engineering for elementary students. Boston, MA: Museum of Science. Bandura, Albert. (2001). Social cognitive theory: An agentic perspective. Annual Review of Psychology, 52(1), 1-26. Brooks, Jacqueline Grennon, & Brooks, Martin G. (1999). In search of understanding: The case for constructivist classrooms. Alexandria, VA: ASCD. Brophy, Sean, & Evangelou, Demetra. (2007, June). Precursors to engineering thinking. Paper presented at the American Society of Engineering Education Annual Conference and Exposition, Honolulu, HI. Chalufour, Ingrid; Hoisington, Cindy; Moriarty, Robin; Winokur, Jeff; & Worth, Karen. (2004). The science and mathematics of building structures. Science and Children, 41(4), 30-34. Cunningham, Christine, & Hester, Kate. (2007, June). Engineering is elementary: An engineering and technology curriculum for children. Paper presented at the American Society of Engineering Education Annual Conference and Exposition, Honolulu, HI. Haberman, Martin. (1991). Pedagogy of poverty versus good teaching. Phi Delta Kappan, 73(4), 290-294. Heckman, James J. (2006). Skill formation and the economics of investing in disadvantaged children. Science, 312(5782), 1900-1902. Heckman, James J., & Masterov, Dimitriy V. (2007). The productivity argument for investing in young children. Review of Agricultural Economics, 29(3), 446-493. Hill, Ann Marie, & Smith, Howard A. (1998). Practice meets theory in technology education: A case of authentic learning in the high school setting. Journal of Technology Education 9(2), 29-45. Johnston, Peter H. (2005). Literacy assessment and the future. The Reading Teacher, 58(7), 684-686. Katehi, Linda; Pearson, Greg; & Feder, Michael (Eds.). (2009). Engineering in K-12 education: Understanding the status and improving the prospects. Washington, DC: National Academies Press. Niemi, Pekka, & Poskiparta, Elisa. (2002). Shadows over phonological awareness training: Resistant learners and dissipating gains. In Erland Hjelmquist & Curt Von Euler (Eds. ), Dyslexia and literacy (pp. 84-99). London: Whurr. Pajares, Frank. (1996). Self-efficacy beliefs in academic settings. Review of Educational Research, 66(4), 543-578. Piaget, Jean, & Duckworth, Eleanor. (1973). Piaget takes a teacher’s look. Learning, 2(2), 22-27. Reifel, Stuart. (1984). Block construction: Children's developmental landmarks in representation of space. Young Children, 40(1), 61-67. Ressler, Stephen J., & Ressler, Eugene K. (2004). 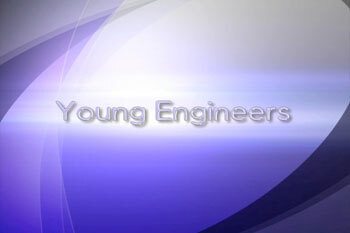 Using a nationwide Internet-based bridge design contest as a vehicle for engineering outreach. Journal of Engineering Education, 93(3), 117-128. Sadler, Philip M.; Coyle, Harold P.; & Schwartz, Marc. (2000). Engineering competitions in the middle school classroom: Key elements in developing effective design challenges. Journal of the Learning Sciences, 9(3), 299-327. Seiler, Gale; Tobin, Kenneth; & Sokolic, Joseph. (2001). Design, technology, and science: Sites for learning, resistance, and social reproduction in urban schools. Journal of Research in Science Teaching, 38(7), 746-767. Vest, Charles M. (2009). Putting the "E" in STEM education. The Bridge, 39(3), 3-4.